One popular version of Andhra style preparation that is absolutely loved at home involves the use of roasted sesame seeds powder. The moment it touches your tongue, you are hit with addictive flavors that make you crave for more. To savor the true taste of traditional recipes like Pulihora, its advisable to prepare from scratch and resist the temptation to follow the easy route of MTR Pulihora instant mix. Yes, even though instant mixes make our life convenient, store bought mixes lack the authentic home made flavors and aromas. Wouldn’t you agree? 2 Heat the remaining oil in a cooking vessel, add the mustard seeds and let them splutter. Add dry red chillis, cumin seeds, channa dal, urad dal and fry for a minute till light brown. Next add the slit green chillis, ginger, asafoetida and few curry leaves and fry for a few seconds. 2 Add the tamarind extract and jaggery and cook till the raw smell of tamarind disappears, approx 5-7 mts. It will be a like a thick but flowing paste. Remove from heat. 3 Add the cooked tamarind mix and combine well such that its spread all over the rice. Adjust salt. Finally sprinkle the roasted sesame seeds pwd and roasted peanuts and combine well. Let it sit for at least 3-4 hours for the flavors to set in. 4 Serve with appadam/chips, majjiga mirapakaayalu (sun dried chillis) and yogurt. Makes a complete meal. Pulihora tastes best after sitting for a couple of hours from the time of preparation. 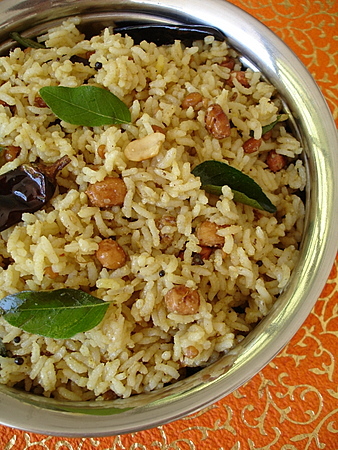 Another version is to replace sesame seeds pwd with a tsp of black mustard seeds pwd (ava podi or paste). This is my entry to Srivalli’s ‘Rice Mela’ and Sunshinemom’s ‘Food In Colours – Brown’ food events. Sprinkle turmeric pwd, salt, a tbsp of oil and few fresh curry leaves to the cooked and cooled rice and keep aside. Heat the remaining oil in a cooking vessel, add the mustard seeds and let them splutter. Add dry red chillis, cumin seeds, channa dal, urad dal and fry for a minute till light brown. Next add the slit green chillis, ginger, asafoetida and few curry leaves and fry for a few seconds. 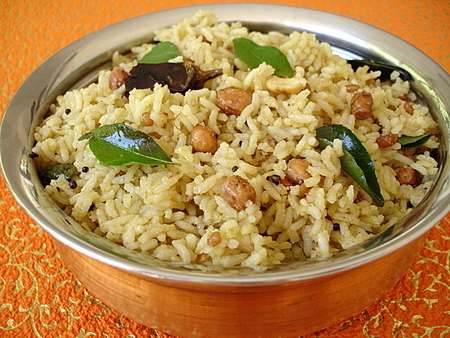 Add the cooked tamarind mix and combine well such that its spread all over the rice. Adjust salt. Finally sprinkle the roasted sesame seeds pwd and roasted peanuts and combine well. Let it sit for at least 3-4 hours for the flavors to set in. Serve with appadam/chips, majjiga mirapakaayalu (sun dried chillis) and yogurt. Makes a complete meal. Looks yummy. My mouth is watering already. Absolutely Sailu, home made powders and sauces definitely make a difference and the fresh taste is something to savor. Your pulihora recipe looks yummmmmmyyy. but i didn’t add sessame and peanut. You said it right, homemade food always gets a special touch of love and respect from people we serve. Homemade is far better for the fresh aroma. Ur bowl of pulihora is very authentic! Thanks for this, made it the other night and it was fantastic! Photo at http://www.flickr.com/photos/newfolder/3018608753/. This might be a stupid question but do you crush the chana and urad dal after frying them? My mom is from Andhra.I tried this recipe Ms.Sailu. It was a winner at home! Thanks again for all the recipes with pictures! Wonderful recipe and nice photos. Just now happened to read this recipe.Thank u for giving such a wonderful recipe. I would like to give one suggestion.Instead of adding Cumin seeds,we can add very little amount of fenugreek seeds.It gives nice flavour.Somehow,cumin seeds doesnt go with tamarind pulihora. And no ginger please in this preparation. hi, i tried many other recipes,but i really liked ur preparation the best.thanks for sharing with us. thank you so much for this recipe.I love Tamarind rice and tried hard to make a good one but every time something would go wrong. this time i followed your instructions and guess what…it came out really well. I’ve added this recipe to my favorites list !!! thanks once again. This is the easiest and most well described recipe of all times – I always refer to recipes online and sometimes, I feel so disappointed with the measurements suggested or the ingredient names mentioned, that I simply dump the recipe. But this recipe is too good! Not only does it taste great, but the recipe writer had taken so much of care and precision while writing this recipe, that there is no scope for any confusion or mistakes. Sailu you did a great job by paying attention to the minutest details – I especially loved the way you have provided names for most ingredients in 3 different languages. I also loved the alterations you suggested – using ava podi instead of sesame seeds. its yummy.thanks for replying as soon. can u pls send palak panneer. It cannot be coincidence that all of them are the same pictures of Tamarind Rice. Wishing you and your family a very Happy Dasserah. hii sailu, i just love andhra spl.pulihora (to the extent that i visit my nearby temple very often for this prasadham).Srivalli is my best friend,we are school mates & i’m really proud of her for what she is today! !My best wishes to u too,for people like u are like cooking encyclopedias..congrats. Sailu, I finally made your Tamarind Rice. We will eat it for dinner, its resting as you suggested to infuse all the flavors well. But I did steal a bowl for myself and it tastes awesome. I was thrifty with the tamarind, ‘coz I don’t like it too overwhelmingly tart. Thanks again for the wonderful recipe. Thanks for the recipe. Helps everyone a lot. Minor suggestion: instead of adding Turmeric in Step #1, you might consider adding it in step #2 (so that the raw taste of Turmeric will disappear). white or black seasame ?